Home→Our Journey→Getting Ready→Master Bath Upgrade – Demolition Begins! Master Bath Upgrade – Demolition Begins! We are anxious to get our house listed for sale but there is one major project that has been holding us back. The upstairs bathroom is just not up to par with the rest of the house and is just one of those abominations that has to go. We have always intended to do a major update, and should have done it last year but we have been enjoying ourselves instead – now its time to buckle down. The photo to the left is how the back end of the bedroom looks today – the door to the left (homemade by the original owner) is the bathroom door, the bifolds are for a closet. Those of you that have seen our house know that we have already updated the downstairs from its original “painfully rustic” appearance to something hopefully more refined and functional. Most of you have probably never seen the upstairs bathroom and that’s because it is basically an embarrassment. It’s poorly designed, has dated fixtures in dated colors, an ugly tile floor, a homemade door that cannot be latched, a very weird and difficult to use closet with no door (photo below right), no medicine chest and would surely be a major detriment from any buyers point of view, particularly relative to the other parts of the house. 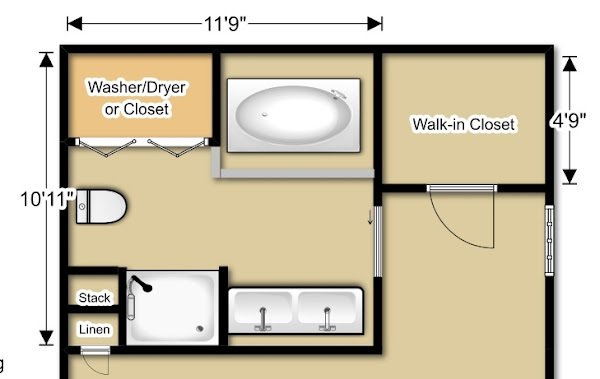 The layout is your basic fiberglass tub/shower, toilet and 36″ vanity, but the way they are situated makes me wonder what the architect was smoking when he drew up the plans. 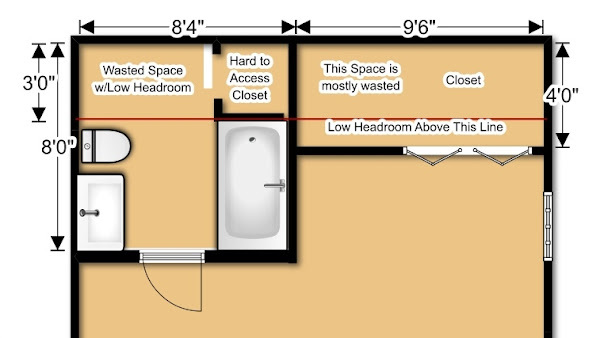 The space is 8′ x 8′, but the house is a cape and the rear third of the bathroom has a sloped ceiling making for some “head-banging” and some only quasi-useful floor space. We will be increasing the bathroom floor space to 11.5′ x 11′ and also modifying (improving) a bedroom closet in the process. 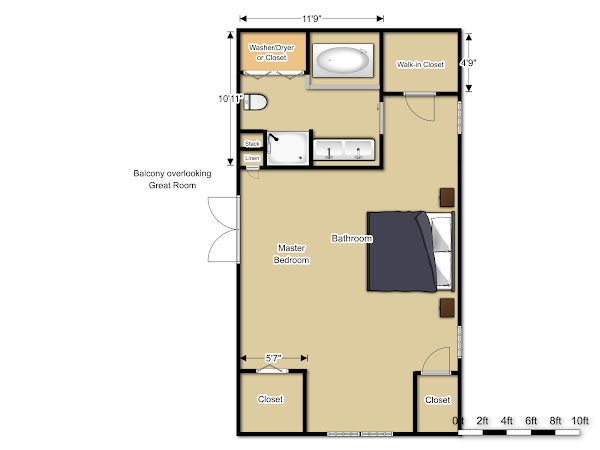 Taking the additional square footage from the single master bedroom on this floor is not an issue – the room is huge at 34′ x 18′, but again has some difficult to use floor space due to the ceiling slope. However, the front of the bedroom (photo left) has a wide dormer making that floorspace fully usable. Two closets occupy the area on either side of the dormer making more appropriate use of the limited headroom (the architect at least got that right). Note that the furniture in the photos is not where it normally lives, but is placed to keep it out of the way during construction. So, the final size of the full headroom part of the master bedroom after the bath expansion (floor plan right) will be 18′ wide, 29′ deep at the longest point and 23′ deep otherwise. There will be 4 closets, 2 of which are walk in’s and the ceiling will remain fully vaulted (about 16′ to the peak). The new bathroom (floor plan left) will be equipped with a 5′ whirlpool (jetted) tub, a 42″ wide by 34″ deep tiled wall shower stall, a five foot vanity with double sink and granite top, a closet that will be large enough to hold a washer dryer (I will pre-plumb the hookups), a skylight (which was already there), a pocket entry door and of course the great white throne, not to mention more floor space and a more comfortable layout. While most RE professionals would probably have advised us we would never get our money back with this upgrade, I will be doing all the labor and we figure the total materials investment will be around $4000. We expect just the improvement in market appeal alone is worth the $4K and we would “lose” a lot more if we left the bath as it was. “Upgrading” the old bath would have entailed a lot of the same expenses and labor time so we felt it was actually easier to do it right. So today we removed some of the wall skins in a fairly neat and mess free manner (see our next post for details). The walls in this 1995 vintage home are skim coat plaster over blue board (standard practice in MA/RI area). One of the goals at this point was to confirm the precise location of the plumbing stack – the fat white pipe (left of the door) that exits out the roof to vent all the sewer gases. Turned out it was about a foot further to the right than we had predicted so that prompted some floor plan modifications. In our next post we will discuss our demolition techniques and update you on the project status. God Bless!!!! and GOOD LUCK!!! ,my son. Rob – Your notes and photos on this project are amazing. Especially for us who haven’t seen the bathroom. The final “new” bathroom will be a showcase.